It is important for parents to expose their children to a wide variety of texts and text forms, and need to teach the vital concepts of print (reading from left to right, spacing words, letter formations etc.) as well as book conventions (turning the page, covers, pictures and print layout). Beginning readers need to see adults reading books, and they need to be read to on a regular basis and have discussions about words and groups of letters. They also need to be encouraged to predict and seek meaning, hear repetitions, rhyme, and pictures that match and expand the text to give them more clues. Understanding what level your child's reading development is at will allow you to have an appropriate response to the situation. Know that print carries a message. Select text primarily for enjoyment. Read and re-read a range of texts. 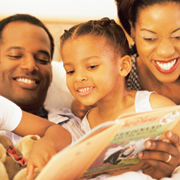 Provide opportunities for child to `read' and `re-read' a variety of texts, both literary and informational. Encourage child to respond to texts in a variety of ways - focus on meaning of print and pictures. Model reading behaviors, such as book handling, distinguishing words from pictures, selecting texts. Know repetitive patterns in very familiar stories. Use some book language in retelling. Begin to understand directionality of print. Provide opportunities for child to talk about texts, relating them to their own experiences. Draw attention to the ways people or characters are represented in text.